The Clanrat forms the mainstay of the Skaven army, a man-shaped mass of filthy matted fur, and weeping lesions topped with glowing red eyes and chisel-teeth. They are the embodiment of debasement, the nobility of mankind stripped bare, leaving only base appetite and cunning. Armed with scavenged weapons and clad in rusting, patchwork armour, lone Clanrats are little threat to a seasoned warrior. Even small groups can be overcome if hearts remain stout and purpose undaunted, for they lack the discipline for shieldwalls or similar defences. Clanrats’ true strength lies in overwhelming numbers, in a tide of shrieking, stabbing vermin given courage by the verminous press of bodies. They scurry from hidden tunnels and concealing shadows, fighting with desperate ferocity until their ranks are broken, and their courage fails alongside. 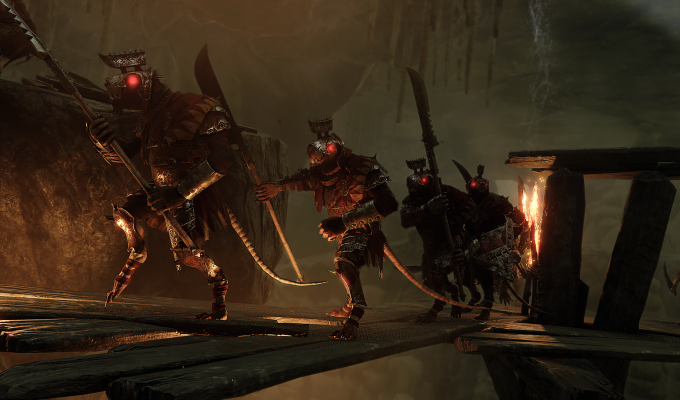 The lowest of the low in the Skaven hierarchy, Skavenslaves perform the most menial and dangerous tasks, and constantly face the threat of being devoured by their kin. In battle, they are deployed without thought for survival, without armour and decent weaponry. Skaven are covetous creatures, and see little sense in wasting precious resource on such wretched, disposable beings. Skavenslaves attack in great numbers, called to the fray by battle horn, or goaded into ambush of an unwary foe. They strike with desperation, as afraid of their masters’ whips as the bite of their enemies’ blades. Many a lone hero has perished to such wretches, dragged down by the frantic multitude. Stormvermin are the fighting elite of the Skaven clans, marked out by crested helms, banded armour and rich red robes. Where other Skaven wield scavenged weapons, Stormvermin train in the use of heavy halberds, a single strike of which can slice through armour to the flesh and bone beneath. Granted bravado by their warrior’s status, Stormvermin seldom shrink from the prospect of battle. Relying on armour to preserve them from harm, they attack unceasingly, using the halberd’s weight to batter aside the foe’s defences before landing a killing blow. A quick-witted warrior is often able to overcome a lone Stormvermin by focusing his blows where the armour is weak. Alas, Stormvermin seldom attack alone, and placing a precision strike is all the harder when surrounded by a shrieking mass of Clanrats. Facing a lone Stormvermin is challenging enough, but all too often these vermin group together in patrolling warbands. Such encounters are challenging to the point that even veteran warriors are known to choose discretion over valour, allowing the patrol to pass rather than confronting it head-on.